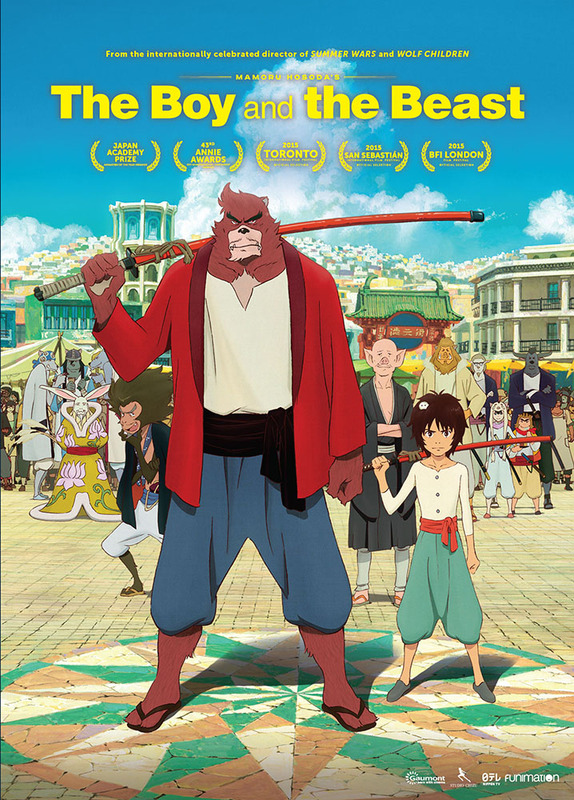 The Boy and the Beast is the latest feature film from award-winning Japanese director Mamoru Hosoda (Summer Wars, Wolf Children): When Kyuta, a young orphan living on the streets of Shibuya, stumbles into a fantastic world of beasts, he’s taken in by Kumatetsu, a gruff, rough-around-the-edges warrior beast who’s been searching for the perfect apprentice. Despite their constant bickering, Kyuta and Kumatetsu begin training together and slowly form a bond as surrogate father and son. But when a deep darkness threatens to throw the human and beast worlds into chaos, the strong bond between this unlikely pair will be put to the ultimate test- a final showdown. Can the two finally work together using all of their combined strength and courage? Don't miss the critically acclaimed film The Boy and The Beast! Mamoru Hosoda's "The Boy and the Beast"
The Boy and the Beast was another great anime by Mamoru Hosoda full of fun and entertaining characters as well as an interesting plot. Both the animation and the music were really well done in this movie and the voice actors were all well cast for both the subtitled Japanese version and the English Dubbed version of the movie. I look forward to seeing what Mamoru Hosoda comes up with next. Mamoru Hosoda already has established himself as one of the premier anime movie directors in the industry, creating original hits in movies such as The Girl Who Leapt Through Time and Wolf Children. The Boy and the Beast continues that trend, with a story that embodies the fantasy realism that Hosoda is well known for. The characters are excellent, and while the pace seems a bit rushed at times, it pays off in that you're able to see a tale develop over a long period of time. At times I wish this movie were in the TV show format, but rather than criticizing it for feeling incomplete, I praise The Boy and the Beast for making me fall in love with the world so much that I wanted to see more.